We know the feeling when we suddenly realise that a piece of fine jewellery that we own no longer suits our needs, or perhaps doesn't reflect our sense of style any longer. Within the Reimagine category, we can help you with exactly that. This is where you can bring those pieces that have been left to sit in the jewellery box, and to turn it into something that is worthy of the person you are today. Read on for stories that we are honoured to have been a part of. Reworking traditional jewellery with a contemporary flair; this necklace was designed for our client who saw her personal taste transform over the years. She came to us with a pair of traditional jade earrings, gifted to her by her mother, for her wedding. She consulted us about refashioning the jade to create something that could work as both an occasion and everyday piece to complement her professional life. Keeping in mind her appreciation for fine details, yet fashion-forward and sleek style, we designed a necklace that would put the unique shape and engravings of the jade at the forefront. A simple claw setting was used around the stones. Circular frames were added as a play on geometric structures, contrasting the organic look of the jade. To accentuate asymmetry, pavé-set white diamonds line the frame as partial borders. This necklace was purposed with an adjustable clasp, threaded through the chain, allowing the wearer to adjust the placement of the necklace as she wishes. The lower jade pendant was also made with a single connecting chain so that it would sway gently with movement. Jewellery deserves to be worn; and we are particularly keen on reimagining it for the wearer as they grow out of it. This client came to us with an exquisite collar button that was very dear to her, and was a special addition to her ensemble. When she started wearing a scarf, or tudung, the button could not serve its purpose any longer. She came to us, wanting to restore its former glory as a statement jewellery piece. Recognising the intricacy and brilliancy of the button, we believed a ring would be most suitable. 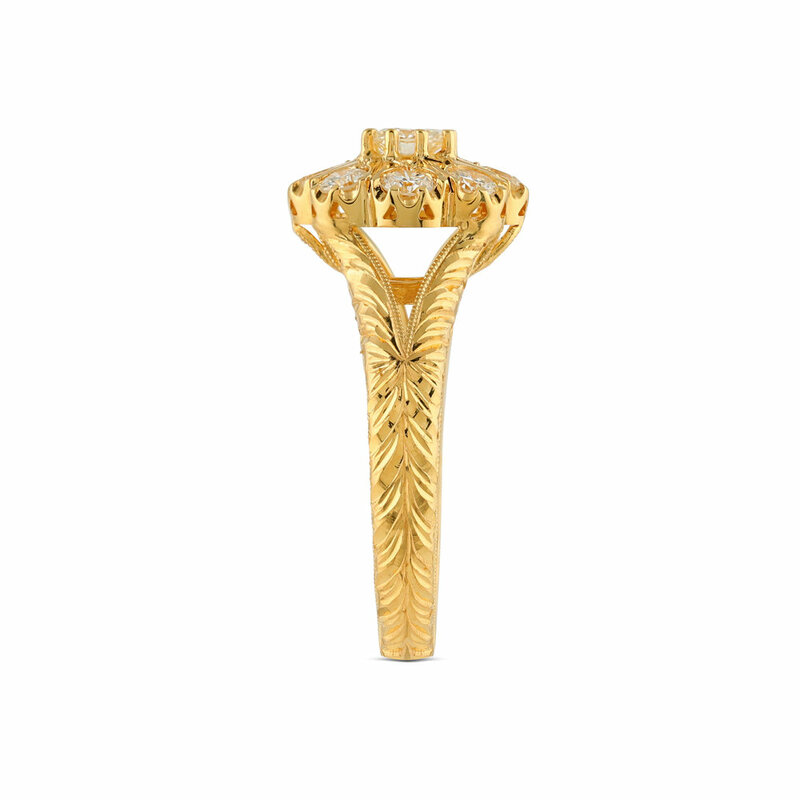 An 18K Yellow Gold split-shank with intricate hand-carved detailing was crafted to highlight purposeful lines and curves on the button. 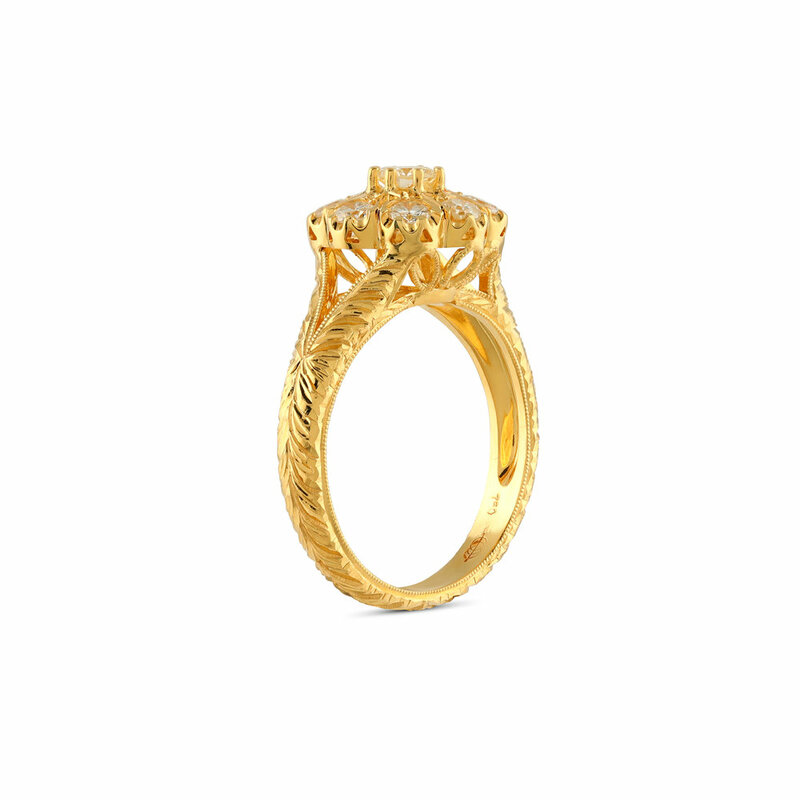 The prongs on the ring were set markedly high, to bring out the most of the diamonds. This journey began with a client coming to us with her own pair of earrings and a ring she wasn’t happy with. She asked us to reimagine her jewellery and turn them into pieces that she could proudly slip on for glamorous occasions. We took to her fashion forward and professional style, as she shared with us her love for rose gold. We noticed her inclination to coloured gemstones, and kept all of this in mind as we began the design process. The large smokey quartz naturally lent itself to the form of a cocktail ring. 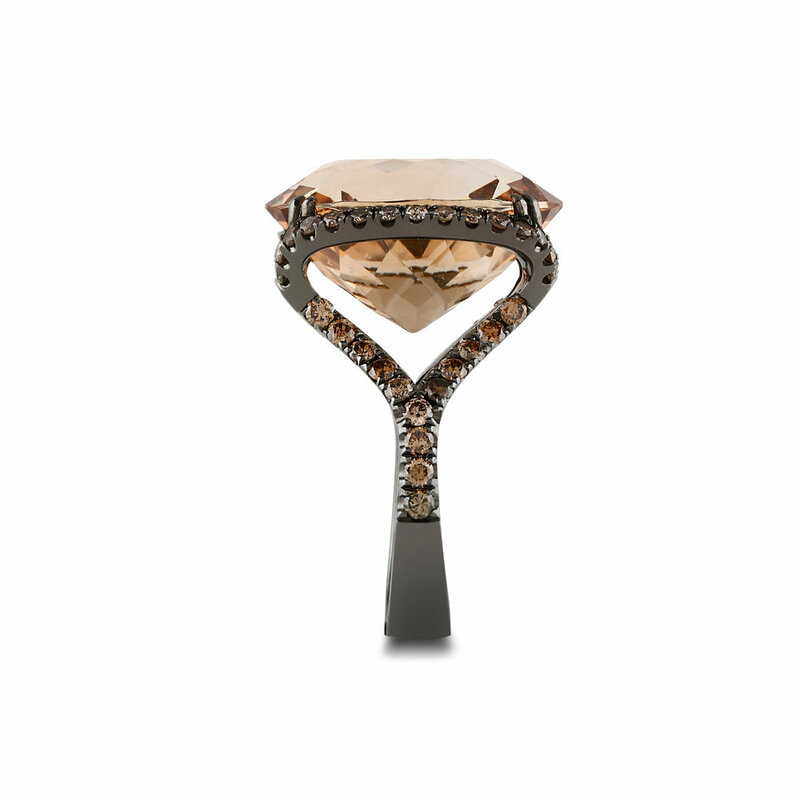 Designed with a darker personality, the ring was built with a rose gold base and plated in a black rhodium. Champagne diamonds were set around the body of the ring in the thinnest possible setting to accentuate the colour and size of the smokey quartz. Our principal designer gave a slight nod to McQueen by using a claw setting to secure the smokey quartz. It really is about the small things. The client brought in a pair of earrings with beautiful Iolite stones. Unfortunately, they were set loosely and this affected the wearability of the earrings. To solve this issue, the original three diamonds were moved to the top, to tightly frame the gemstone. We felt that the rich colour of the Iolite could be further accentuated. We did this by adding pink sapphires along the curve of the gemstone. These pair of earrings were set in 18K rose gold, bringing the whole look together.